Biofilm formation by Candida albicans has shown to be highly variable and is directly associated with pathogenicity and poor clinical outcomes in patients at risk. The aim of this study was to test the hypotheses that the extracellular DNA release by C. albicans is strain dependent and is associated with biofilm heterogeneity. Initially, biofilm formed by C. albicans high biofilm formers (HBF) or low biofilm formers (LBF) were treated with DNase to find whether eDNA play a role in their biofilm formation. Digestion of biofilm eDNA significantly reduced the HBF biofilm biomass by five fold compared to untreated controls. In addition, quantification of eDNA over the period of biofilm formation by SYBR green assay demonstrate a significantly higher level of 2 to 6 fold in HBF compared to LBF. Biochemical and transcriptional analyses showed that chitinase activity and mRNA levels of chitinase genes, a marker of autolysis, were upregulated in 24 h biofilm formation by HBF compared to LBF, indicating autolysis pathway possibly involved in causing variation. The biofilm biomass and eDNA release by single (∆cht2, ∆cht3) and double knockout (∆cht2/∆cht3) chitinase mutants were significantly less compared to their parental strain CA14, confirming the role of chitinases in eDNA release and biofilm formation. Correlation analysis found a positive correlation between chitinases and HWP 1, suggesting eDNA may release during the hyphal growth. Finally, we showed a combinational treatment of biofilms with DNase or chitinase inhibitor (acetazolamide) plus amphotericin B significantly improved antifungal susceptibility by 2 to 8 fold. Collectively, these data show that eDNA release by C. albicans clinical isolates is variable and is associated with differential biofilm formation. Digestion of biofilm eDNA by DNase may provide a novel therapeutic strategies to destabilise biofilm growth and improves antifungal sensitivity. Candida albicans is a dimorphic fungal pathogen that causes both superficial and systemic candidiasis . Invasive systemic forms of the disease affect at-risk patients and can lead to mortality rates as high as 63% in some instances . The disease is multifactorial , yet the capacity of C. albicans to form biofilms has been identified as a pivotal factor to patient outcomes ,. These structures are found frequently associated with indwelling medical devices, as well as biological surfaces such as the mucosa , and are clinically important due to their high recalcitrance to antifungal treatment . However, there is increasing evidence in the literature that C. albicans biofilm formation is heterogeneous, which has a direct impact upon treatment and pathogenicity ,-. Studies have indicated that depending on the ability to form a biofilm, or not, has a bearing on patient outcomes, though the conclusions from some of these studies are diametrically opposed ,. Therefore, rather than defining biofilm formation as an absolute parameter we have recently described a series of clinical isolates with a differential ability to form biofilms, in which high biofilm forming (HBF) isolates displayed a greater pathogenic capacity and lower antifungal sensitivity when compared to low biofilm forming (LBF) isolates . However, the mechanisms underlying the difference in biofilm formation are not yet fully understood. Extracellular matrix (ECM) is an important and defining characteristic of biofilms, providing a structural scaffold whilst coincidentally facilitating protection from external factors, including antifungal agents ,. Typical fungal biofilm ECM is a heterogeneous substance consisting of exopolysaccharides, proteins, surfactants, lipids and water ,, though recent studies have shown the presence of another important component extracellular DNA in fungal biofilm matrix ,. These studies demonstrated that eDNA plays a significant role with respect to structural stability and as a consequence antifungal sensitivity. In both C. albicans and A. fumigatus it was shown that addition of exogenous DNA significantly improved biofilm formation, and that depletion of biofilm eDNA through the addition of DNase adversely affects the biomass ,. It can be inferred from bacterial biofilm studies that eDNA has a multifactorial purpose, namely as a nutrient source , facilitator of genetic information exchange , contributor to biofilm stability and dispersal -, and as an antimicrobial resistance factor ,. The mechanism of eDNA release in biofilm environment is not yet fully understood, though studies in bacterial species suggests various mechanisms that are potentially responsible for this process, including cell lysis ,. We recently demonstrated the association of the chitinase regulated autolytic pathway with eDNA release in A. fumigatus, however, chitinase activity in C. albicans biofilms with respect to eDNA has yet to be studied. Given that eDNA contributes to ECM integrity, and ECM is a key factor in promoting biofilm formation, we hypothesised that the capacity to release eDNA through differential chitinase activity may be an underlying mechanism supporting biofilm heterogeneity. C. albicans SC5314 and a series of routine patient anonymised clinical bloodstream isolates (n = 6) were collected under the approval of the NHS Scotland Caldicott Gaurdians from the Royal Hospital for Sick Children (Yorkhill Division), Glasgow, UK, as part of candidaemia epidemiology surveillance study were used throughout this study. Furthermore, chitinase mutants Δcht2, Δcht3, Δcht2/ Δcht3, including the parental strain CA14 were also used. Isolates were stored on Sabouraud dextrose agar (Oxoid, Basingstoke, UK) at 4°C. All C. albicans strains were grown on YPD at 37°C overnight. Cells were then washed and resuspended in appropriate media to the desired concentration, as described previously . All procedures were carried out in a laminar flow cabinet (Hera Safe laminate flow cabinet, Kendro, model K515). The growth rate of the clinical isolates was first assessed. Each isolate was standardised to 1 × 104 cells/mL in YPD dispensed into each well of a 96 well round-bottom plate and incubated at 37°C for 24 h. The absorbance was measured at 530 nm every 1 h in a microtitre plate reader (FluoStar Omega, BMG Labtech). Each isolate was tested in duplicate and repeated on three independent occasions. Negative controls containing no C. albicans were included for background correction. For biofilm screening isolates were processed as described previously . Biofilms were then grown in a 96 well flat-bottomed polystyrene plate (Corning Incorporated, NY, USA) at 37°C for 24 h as described previously . Following incubation, biofilms were carefully washed twice with PBS to remove any non-adherent cells and biomass of each isolate assessed using a crystal violet assay (CV) . Air dried biofilms were stained with 0.05% w/v CV for 20 min, washed to remove excess stain, then destained with 100% ethanol. This was transferred to a new 96 well plate and absorbance was read at 570 nm. Isolates with CV absorbance of ≥1.5 were classified as high biofilm former (HBF) and ≤0.5 were classified as low biofilm former (LBF), as previously described . The role of eDNA in C. albicans biofilm formation was first investigated by depletion of eDNA within the biofilm using a hydrolytic enzyme DNase I. DNase I from bovine pancreas (Sigma-Aldrich) was prepared in 0.15 M NaCl supplemented with 5 mM of MgCl2. Biofilms of HBF (n = 3) and LBF (n = 3) isolates were grown in RPMI-1640 as described above. Following incubation, biofilms were washed with PBS and treated with 256 μg/mL of DNase (Sigma-Aldrich) for 24 h at 37°C, a concentration previously shown to decrease fungal biofilm biomass ,. Untreated controls were also included for direct comparison. Biofilms were then washed twice with PBS and the biomass was scraped from the surface and passed through 0.22 μM membrane filters. Biofilms retained on the filters were dried overnight at 60°C and then dry weight measurements were taken for each isolate, as described previously . Measurement of each isolate was carried out in duplicate, on three independent occasions. C. albicans isolates with LBF (n = 3), HBF (n = 3), CA14, and chitinase mutants Δcht2, Δcht3 and Δcht2/ Δcht3 biofilms were grown in RPMI-1640 for 4 and 24 h at 37°C. The quantity of eDNA release was measured using a microplate fluorescence assay (MFA) using a DNA binding dye (SYBR® Green I), as previously described . Briefly, SYBR® Green I (Invitrogen) was added to biofilm supernatants in a black well microtitre plate (Costar3603; Corning) at a ratio of 1:4. Binding of this dye produces fluorescence directly proportional to DNA concentration. The levels of eDNA were quantified using a fluorescence plate reader (Fluostar Optima; BMG Labtech) at 485 and 518 nm, respectively. The concentration of eDNA in the sample was quantified using the DNA standard curve as previously described . In addition, optical density of the culture was measured at 530 nm simultaneously for normalising the relative fluorescence units (RFU) data. Each isolate was tested in duplicate, on three separate occasions. Standardised C. albicans (1 × 106 cells/ml) were inoculated in RPMI medium onto Thermanox™ coverslips (13 mm) within a 24-well tissue culture plate, then incubated for 24 h at 37°C. These were gently rinsed with PBS and stained according to the manufacturers’ instructions with 5 μM calcofluor white (Invitrogen), which binds chitin and beta-glucans of fungal cell walls, and with 20 μM propidium iodide (PI) (Sigma), which stains the DNA present within a biofilm. Biofilm growth and accumulation of eDNA were visualized under a fluorescence microscope (Motic BA400 Colorview system) at Ex350/Em400 for calcofluor white, and Ex540/Em525 for propidium iodide. Representative images from 10 fields were taken and one from each group was digitally photographed. C. albicans chitinase activity was quantified from isolates with LBF (n = 3) and HBF (n = 3) after 4 and 24 h of biofilm formation using a fluorometric chitinase assay kit (Sigma, United Kingdom), as per the manufacturer’s instructions. Following biofilm development, supernatants were collected at 4 and 24 h, and an appropriate volume of each sample was incubated with a substrate working solution (4-methylumbelliferyl N-acetyl-β-d-glucosaminide) at 37°C for 30 min. Fluorescence was then quantified at Ex360/Em450. Appropriate positive and negative controls included in the kit were added to each plate. Chitinase activity was calculated and expressed as a ratio between chitinase units and optical density of culture (U/OD). Each isolate was measured in duplicate, on three separate occasions. C. albicans HBF (n = 3) and LBF (n = 3) biofilms were prepared in 24 well polystyrene plates as described above for 4 and 24 h at 37°C. Quantitative analysis of transcriptional changes within these biofilms was performed as previously described . Briefly, RNA was extracted by mechanical disruption in TRIzol (Invitrogen) and purified using an RNeasy MinElute cleanup kit (Qiagen, Crawley, United Kingdom) as per the manufacturer’s instructions. RNA was quantified and its quality determined using a NanoDrop spectrophotometer (ND-1000; Thermo Scientific, Loughborough, United Kingdom). Then, cDNA was synthesised with a high-capacity RNA-to-cDNA master mix (Applied Biosystems), using a MyCycler PCR machine (Bio-Rad, Hertfordshire, United Kingdom), and was stored at −20°C for expression analysis. The expression of the chitinase genes CHT2 and CHT3 and markers of hyphal cell growth and adhesion (HWP 1 and ALS 3) were then assessed using quantitative reverse transcription-PCR (RT-PCR) with SYBR® GreenER™ (Invitrogen), according to the manufacturer’s instructions. Primer sequences for these genes are shown in Table 1. The individual gene expression levels were then calculated using the 2−ΔCT method for different phases and normalized to the ACT1 housekeeping gene. All isolates were tested in duplicate for this experiment. C. albicans single (Δcht2, Δcht3), double knockout (Δcht2/ Δcht3) chitinase mutants and their parental strain CA14 were standardised and grown as biofilm in RPMI-1640 directly onto Thermanox™ coverslips (Nunc, Roskilde, Denmark) for 24 h. Following biofilm development, biofilms were carefully washed with PBS before fixation in 2% para-formaldehyde, 2% gluteraldehyde and 0.15 M sodium cacodylate, and 0.15% w/v Alcian Blue, pH 7.4, and prepared for scanning electron microscopy (SEM), as previously described . The samples were sputter-coated with gold and viewed under a JEOL JSM-6400 SEM. Images were assembled using Photoshop software (Adobe, San Jose, CA, USA) at magnification × 1000. The impact of eDNA and chitinases on amphotericin B sensitivity was assessed using a hydrolytic enzyme DNase I and a chitinase inhibitor acetazolamide ([AZE] Sigma-Aldrich). C. albicans LBF (n = 3), HBF (n = 3) and SC5314 were standardized to 1 × 106 cells/ml in RPMI-1640 and biofilms grown in flat bottomed 96 well plates for 4 and 24 h. Preformed biofilms were washed twice with PBS and treated with serially diluted AMB ± DNase (256 μg/ml) or ± AZE (256 μg/ml). The concentrations of DNase and AZE were previously shown to be effectively disrupting the biomass and improve antifungal sensitivity ,. Biofilms were incubated for a further 24 h at 37°C before metabolic activity assessed using the XTT assay, as described previously . Analysis of variance (ANOVA) and t-tests were used to investigate independent sample data. A Bonferroni correction for multiple comparisons was applied to the data where appropriate. SPSS (Version 11, Chicago, USA) was used for these analysis and GraphPad Prism (Version 4, La Jolla, USA) for the production of the figures. The Spearman’s rho correlation coefficient was determined to investigate the relationship between the parameters measured. A p value of less than 0.05 was considered significant. Initially, we assessed C. albicans biofilm formation by six bloodstream isolates defined as either low biofilm former (LBF, n = 3) or high biofilm former (HBF, n = 3) based on biomass quantification. A significant difference in biofilm formation was observed between isolates with LBF and HBF, where 11.6× more (p = 0.0035) biomass was observed in the latter group (Figure 1A). We then evaluated whether the presence of eDNA contributed to C. albicans biofilms formation. To do so we investigated how each LBF and HBF isolate responded to DNase treatment. A significant biomass (dry weight) reduction was observed for the HBF (p < 0.01), with a 5-fold decrease in biomass compared to untreated controls (Figure 1B). In comparison, isolates with the LBF phenotype did not show any significant biomass reduction. To further investigate the hypothesis that eDNA preferentially supported biofilm growth, we evaluated its release from both HBF and LBF at 4 and 24 h using SYBR green I assay. eDNA release was significantly greater in isolates with HBF compared to LBF at both 4 h and (2.78 fold, p < 0.05) and 24 h (5.89 fold, p < 0.01) (Figure 1C). Moreover, eDNA release increased significantly by a further 2.79 fold (p = 0.0221) in HBF isolates between 4 and 24 h. No differences in growth rates were observed between the 6 test isolates (Additional file 1: Figure S1). Variation in C. albicans biofilm formation and eDNA release. C. albicans isolates with LBF (n = 3) and HBF (n = 3) were grown as biofilms in 96 well flat-bottom microtitre plates at 37°C for 24 h. (A) Biofilm biomass was assessed spectrophotometrically by reading CV absorbance, data represents mean ± SD. (B) Biofilms were treated ± 256 μg/ml DNase for a further 24 h before being passed through 0.22 μM membrane filter. Biomass retained on the filters was dried overnight at 60°C and dry weight measurements taken. In addition, biofilms were stained with CV and imaged to show the disruptive effect of DNase on the biofilms, data represents mean ± SE. (C) Isolates were grown as biofilms for 4 and 24 h in the presence of the DNA binding dye SYBR® Green I. Fluorescence was measured after 4 and 24 h at Ex485/Em518. Absorbance was measured simultaneously for normalising the fluorescence data, data represents mean ± SD. Each isolate was tested in duplicate, on three independent occasions. *#p < 0.05, **p < 0.01. Next, the impact of eDNA on AMB sensitivity was then tested to determine its role in antifungal resistance. It was shown that isolates with LBF were up to 8-fold more susceptible to AMB than those with HBF at 4 h. However, when comparing these biofilm subsets at 24 h there was only a 2-fold difference in MIC (Table 2). The addition of DNase during AMB treatment did not have an impact on isolates with LBF at 4 h, with only a 2-fold difference observed at 24 h with DNase treatment. In contrast, isolates with HBF were most susceptible to AMB + DNase therapy at both time points, particularly 24 h where up to 8-fold decrease in MIC were observed in the presence of DNase. 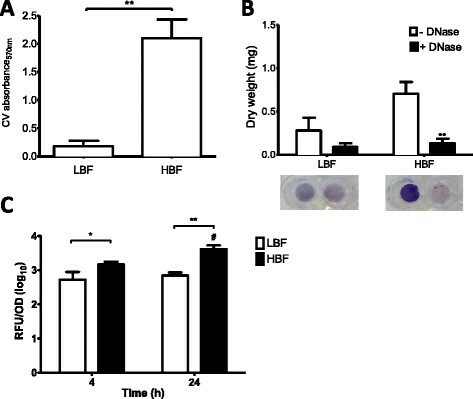 The addition of DNase with AMB increased AMB sensitivity by up to 2 and 8-fold in HBF isolates from 4 and 24 h biofilms, respectively, whereas, those LBF isolates showed no change at 4 h, and only a 2 fold change at 24 h (Table 2). *MIC50 – Minimum concentration of AMB at which 50% reduction in viability assessed by XTT assay. **FC – Fold change in MIC of AMB in the presence and absence of DNase or acetazolamide (AZE). Based on previous work from our group, which showed a positive correlation between chitinase activity in Aspergillus fumigatus biofilms and eDNA release , we decided to evaluate whether this property was also observed in C. albicans biofilms. Although no differences in chitinase activity were identified with biochemical assay between LBF and HBF isolates at 4 h, a significant change of ~3-fold greater activity detected at 24 h (p < 0.05) with HBF compared to LBF (Figure 2A). Furthermore, transcriptional analysis found no difference in CHT2 expression at 4 h between the two biofilm subsets, a significant up-regulation by 23% (p < 0.05) was observed at 24 h in those with HBF compared to those with LBF (Figure 2B). In addition, despite CHT3 expression being increased by 4-fold and 3-fold in isolates with HBF than LBF at 4 and 24 h, respectively, no significant difference between the groups was observed (Figure 2C). 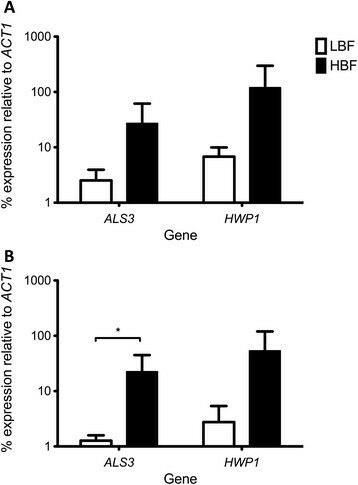 In addition, the expression of biofilm-related genes HWP1 and ALS3 in C. albicans biofilms was evaluated and it was found that these were up-regulated in isolates with HBF. 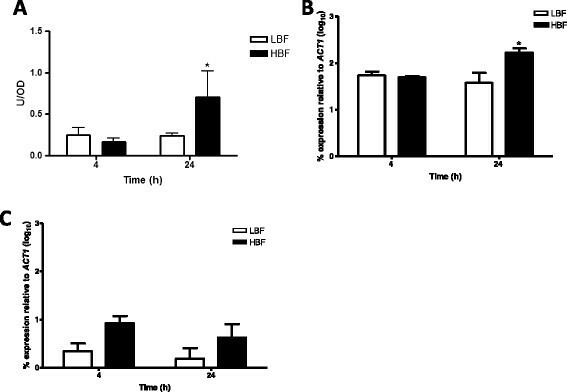 Despite ALS3 and HWP1 expression being increased in HBF by 11× (p = 0.1143) and 18× (p = 0.1447) at 4 h (Figure 3A) when compared to LBF respectively, the only significant difference in the transcriptional analysis was observed at 24 h where LBF had 18× less expression of ALS3 (p = 0.0102) than HBF (Figure 3B). Chitinases play a role in C. albicans biofilm formation. Three C. albicans isolates with LBF and HBF were standardised to 1 × 106 cells/ml in RPMI-1640 and grown in 24 well microtitre plates at 37°C for 4 and 24 h. (A) Supernatants were retained and mixed with a chitinase substrate working solution for 30 min at 37°C. Fluorescence was measured at 360 and 450 nm and chitinase activity represented at U/OD, normalised to isolate biomass. Each isolate was measured in duplicate, on three separate occasions. (B-C) Biofilms with LBF (n = 3) and HBF (n = 3) were washed with PBS and RNA extracted using the TRIzol method, cDNA synthesised and real-time PCR used to measure the expression of CHT2 (B) and CHT3 (C). Percentage of gene expression is shown as log10 mean ± SD relative to housekeeping gene ACT1. *p < 0.05. Expression of biofilm related genes is up-regulated in C. albicans isolates with HBF. Biofilms with LBF (n = 3) and HBF (n = 3) were grown for 4 (A) and 24 h (B) before RNA extracted, cDNA synthesised and qPCR used to measure the expression of ALS3 and HWP1. Each individual isolate was measured in duplicate. Percentage of gene expression is represented by mean ± SD relative to housekeeping gene ACT1. *p < 0.05. To investigate the relationship between eDNA release, chitinase activity, biofilm biomass and genes related to biofilm formation (HWP1 and ALS 3), a Spearman’s rho correlation analysis was performed (Table 3). A significant correlation was observed between eDNA release and biomass (p < 0.01), chitinase activity (p < 0.01), and expression of HWP1 (p < 0.05) and ALS3 (p < 0.05) at 24 h. A significant positive correlation was also found between chitinase activity and expression of HWP1 (p < 0.05) in 24 h biofilms (Table 3). *Correlation is significant at the 0.05 level. 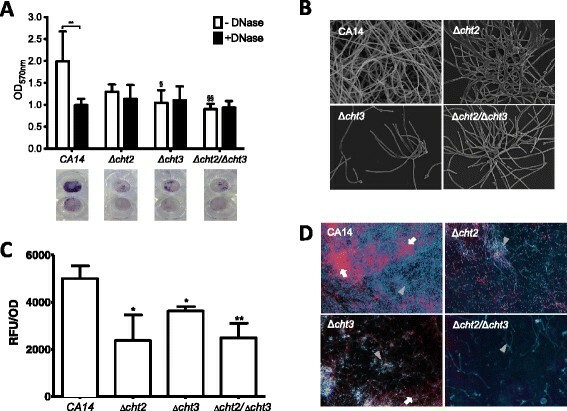 C. albicans single and double knockout mutants Δcht2, Δcht3 and Δcht2/ Δcht3 were assessed to confirm whether these chitinases played a role in eDNA release and biofilm formation. These all showed a reduction in biofilm biomass when compared to their parental strain CA14. However, a significant reduction was found only with Δcht3 (p < 0.05) and Δcht2/ Δcht3 (p < 0.005) (Figure 4A). To investigate whether this reduction in biomass is caused by presence of eDNA, the biofilms were treated with DNase. Here a significant reduction in biofilm biomass by 2-fold was observed with DNase treatment in CA14 compared to untreated controls (p < 0.01). Conversely, no significant reduction was observed with either single or double knockout mutants (Figure 4A). The reduction in biofilm formation by all the knockout mutants was confirmed by microscopy (Figure 4B). SEM imaging showed reduced biomass in these isolates compared to CA14, with Δcht3 showing the clearest visual difference, providing evidence that chitinases plays a role in C. albicans biofilm formation. eDNA release was also quantified in these mutants. All knockout strains had significantly reduced eDNA release after 24 h. The greatest reduction was in Δcht2, where a significant eDNA reduction of 53% (p < 0.05) was measured compared to the wild-type, followed by Δcht2/ Δcht3 with reduction of 50% (p = 0.0061), and Δcht3 where eDNA release was reduced by 26% (p = 0.0161) (Figure 4C). The level of eDNA present in these knockout mutants was confirmed visually using fluorescence imaging. The presence of eDNA in the parental strain CA14 is shown by the abundance of red/pink fluorescence, which was notably reduced in the single knockouts Δcht2 and Δcht3, and completely absent from the double knockout Δcht2/Δcht3 (Figure 4D). Compromising chitinase activity decreases eDNA release and biofilm formation in C. albicans . C. albicans Δcht2, Δcht3, Δcht2/ Δcht3 and parental strain CA14 biofilms were grown in 96 well microtitre plates for 24 h at 37°C in RPMI (A) Following biofilm development, biofilms were carefully washed with PBS and incubated in RPMI for a further 24 h, ± 256 μg/ml DNase. Biomass assessed spectrophotometrically by measuring CV absorbance at 570 nm. Also CV stained biofilms were digitally imaged to show the difference in biofilm formation and effect of DNase treatment. §P < 0.05, §§ p < 0.01. (B) C. albicans Δcht2, Δcht3, Δcht2/ Δcht3 and wild type CA14 (×1000) were grown on Thermanox™ coverslips for 24 h at 37°C. Biofilms were then processed and viewed on a JEOL JSM-6400 scanning electron microscope and images assembled using Photoshop software. Note the reduction in biofilm biomass in Δcht3 and Δcht2/ Δcht3. (C) eDNA release was measured after 4 and 24 h using SYBR green I assay, normalised to each isolates biomass. Each isolate was measured in duplicate, on three separate occasions. *p < 0.05, **p < 0.01. (D) Biofilm growth (hyphal cells indicated by arrow head) and accumulation of eDNA (Indicated by arrow) were visualized under a fluorescence microscope (Motic BA400 Colorview system) at an Ex/Em wavelengths of 350/400 nm for calcofluor white and 540/525 nm for propidium iodide. One representative from each group was digitally photographed. Finally, to test whether pharmacological inhibition of chitinases impacted antifungal sensitivity, AZE was used in combination with AMB. It was shown that the addition of AZE did not alter AMB sensitivity in any of the LBF biofilms at 4 h and 24 h. However, isolates with HBF had up to a 2 fold decrease in MIC50 at both 4 and 24 h (Table 2). Our group have recently described that biofilms formed by different clinical isolates of C. albicans are heterogeneous. Significant variation in their ability to form and maintain biofilm structure exists between bloodstream isolates, which was shown not only to impact biofilm formation, but also pathogenicity and antifungal sensitivity . Understanding why these isolates differ would be useful in developing better management strategies, both in terms of antifungal therapy, but potentially also for development of new molecular diagnostics. The data presented herein describes a novel role for eDNA release in conferring heterogeneity during biofilm formation by C. albicans, which is associated with chitinase regulated autolytic events, and which contributes to biofilm associated antifungal resistance. There have been limited studies to date examining the presence and role of eDNA in C. albicans biofilms ,,. These studies demonstrate that the quantity of eDNA in biofilms varied considerably with the growth medium used, with RPMI showing a significantly higher accumulation of eDNA in ECM compared to other tested media . We reported that RPMI consistently supports optimal biofilm formation for C. albicans. Given that eDNA was associated with high levels of biofilm formation it was hypothesised that this may explain the underlying mechanism for the heterogeneity, i.e. those isolates with the propensity to form biofilms may release more eDNA than isolates forming structurally simple biofilms. This is supported by the data showing that addition of exogenous DNA has been shown to significantly improve biofilm biomass ,. Moreover, there are studies highlighting the importance of eDNA within mixed C. albicans and bacterial biofilms ,. To test these hypotheses two groups of contrasting biofilm forming abilities were investigated. Based on two biomass quantification assays the isolates were categorised as LBF and HBF, from which eDNA release was initially evaluated. Here the levels of eDNA observed were greater in isolates with HBF, which also increased with biofilm maturity, which is a similar finding to that reported in studies of A. fumigatus biofilm development . The release of eDNA in fungal biofilms is hypothesised to be an end product of autolysis, a process controlled by various hydrolases, including chitinases ,. C. albicans have also been shown to possess complex chitinase families that hydrolyse chitin molecules in fungal cell wall . These enzymes are known to be involved in spore formation, hyphal growth, hyphal branching and septum formation. There are four chitinase genes known in C. albicans (CHT1-4), though their function remains unclear. CHT2 and CHT3 have been shown to be associated with yeast to hyphal morphogenesis and are more active in the hyphal form . Here it was reported that these enzymes were transcriptionally expressed and biochemically active during the release of eDNA, which in turn contributes towards biofilm formation. Indeed, correlation analysis demonstrates the functional relationship between eDNA release, chitinase activity and biofilm formation. Furthermore, a positive correlation between chitinase activity and a hyphal cell marker HWP1 suggest the involvement of chitinases in hyphal growth, which in turn contributes to eDNA release. This may explain the morphological differences between the HBF and LBF, of which the former demonstrates more filamentous growth . It was also shown that compromising chitinase activity through gene deletion of Δcht2, Δcht3 and Δcht2/ Δcht3 significantly affects eDNA release and biofilm formation, which suggests a role for chitinases in the maintenance and architecture of C. albicans biofilms. From a translational perspective, the mechanism of eDNA release could represent an Achilles heal in the management of tenacious HBF isolates. eDNA release was shown to improve AMB resistance, demonstrated through DNase combinational treatments and also through pharmacological inhibition of chitinases that may regulate eDNA release. Collectively, these data demonstrate the possibility of improving our treatment of these infections through rationally designed strategies. Mismanagement also has important repercussions, as it has been shown that treatment with sub-MIC levels of antifungals causes an increase in chitin content within Candida species, which relates to decreased antifungal sensitivity ,. Moreover, a recent study has shown the use of sub-lethal concentrations of antibiotics leads to increased autolysis, eDNA release and biofilm formation in bacteria . Tumbarello and colleagues identified inadequate antifungal therapy as a predictor of patient mortality , with other studies highlighting the importance of efficient and appropriate treatment of candidaemia cases ,. Therefore, careful consideration must be given with regards to antifungal use as ineffectual therapy can lead to increased antifungal resistance and increased hospital lengths of stay. The data from this study showed a variation in biofilm formation among C. albicans isolates and how it affects the antifungal sensitivity. Strain dependent eDNA release and chitinase activity is associated with biofilm formation. Finally, pharmacological inhibition of eDNA by DNase or AZE reduced biofilm resistance to AMB in C. albicans. Thus, we establish a potential mechanism regulating biofilm heterogeneity and antifungal resistance, and that targeting eDNA may provide an effective strategy for management of biofilm based infections. Margaret Mullin (University of Glasgow) for her assistance in scanning electron microscopy techniques. RR and LS participated in the study design, carried out the experimental studies, performed statistical analysis and were responsible for the manuscript. DFL and CJN participated in study design, assisted with statistical support and helped draft the manuscript. CW contributed to study design and supervised manuscript writing. KS participated in qPCR analysis and manuscript writing. CAM participated in study design and analysis. GR conceived the study, participated in study design, data analysis and was responsible for writing and submission of the final manuscript. All authors read and approved the manuscript.